BALTIMORE (CNS) — UPDATED — Archbishop Joseph E. Kurtz of Louisville, Ky., was elected president of the U.S. Conference of Catholic Bishops by a wide margin Nov. 12. The archbishop, the current USCCB vice president, received 125 votes during the first round of balloting during the fall general assembly of the U.S. bishops in Baltimore. In the voting for vice president, Cardinal Daniel N. DiNardo of Galveston-Houston was elected to the post during the third round of voting. He defeated Archbishop Charles J. Chaput of Philadelphia, 147 to 87. Archbishop Kurtz easily outdistanced the nine other candidates for president, who received a total of 111 votes. Cardinal DiNardo tallied the second highest vote total with 25. 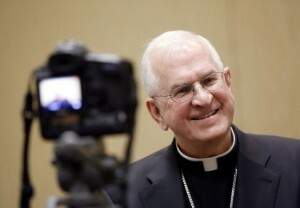 With the election of Archbishop Kurtz to head the USCCB for the next three years, the bishops returned to the practice of electing a sitting vice president to the conference presidency. The archbishop, who has headed the Louisville Archdiocese since 2007, had no immediate comment after his election and acknowledged the vote with a simple wave to his fellow bishops on the floor of the assembly. In 2010, the bishops elected then-Archbishop Timothy M. Dolan of New York as president. His term was to end Nov. 14 as the fall general assembly concluded. The election of the New York prelate, named a cardinal in February 2012, marked the first time since the bishops’ conference was reorganized in 1966 following the Second Vatican Council that a sitting vice president who sought the presidency did not win the election. He defeated then-vice president Bishop Gerald F. Kicanas of Tucson, Ariz., on the third ballot. In two previous elections, circumstances dictated that the vice president did not rise to lead the conference. In 1974, Coadjutor Archbishop Leo C. Byrne of St. Paul and Minneapolis, vice president since 1971, died less than a month before his term ended. Three years later, Cardinal John J. Carberry of St. Louis as vice president declined to run for the top spot because he was 73 and due to retire before he could complete a three-year term as president. The president and vice president are elected by a simple majority from a slate of 10 nominees. If no president or vice president is chosen after the second round of voting, a third ballot is taken between only the top two vote-getters on the second ballot. 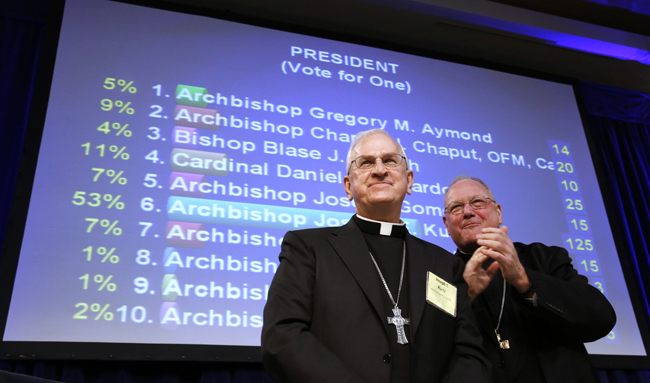 In this year’s USCCB election, the vote for vice president took three ballots to conclude. In each round, Cardinal DiNardo was the leading vote-getter. He received 51 votes during the first round and 78 votes during the second round. After the second ballot, the top two vote-getters moved to a third round of voting. With 40 votes, Archbishop Chaput narrowly defeated Archbishop Jose H. Gomez of Los Angeles and Archbishop Gregory M. Aymond of New Orleans, both of whom received 39 votes. 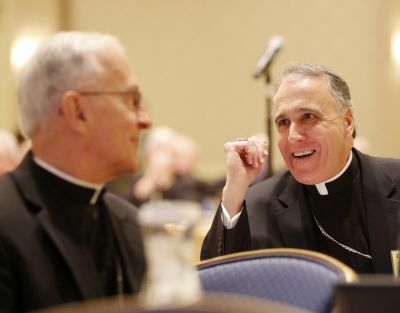 Cardinal DiNardo has headed the Archdiocese of Galveston-Houston since 2006, when as coadjutor archbishop, he immediately succeeded Archbishop Joseph A. Fiorenza when he retired. Then-Archbishop DiNardo was named a cardinal in 2007, making him the first cardinal from Texas. The cardinal was set to begin a three-year term as chairman of the Committee on Divine Worship at the conclusion of the assembly, but he had to vacate that seat when he was elected vice president. The bishops voted to elect Bishop Arthur J. Serratelli of Paterson, N.J., to the position over Archbishop Allen H. Vigneron of Detroit, 114-112. In other elections on the second day of their Baltimore assembly, the bishops chose Archbishop George J. Lucas of Omaha, Neb., as chairman of the Committee on Education in a 141 to 93 vote over Bishop George V. Murry of Youngstown, Ohio. Archbishop Lucas has served as interim chair of the committee since the May 2013 death of Bishop Joseph P. McFadden of Harrisburg, Pa., and was to begin his term at the conclusion of the bishops’ meeting. The bishops also voted for chairmen-elect for five committees. They will take over their chairmanships at the conclusion of the bishops’ November 2014 general assembly. — Coadjutor Archbishop Bernard A. Hebda of Newark, N.J., as chairman-elect of the Committee on Canonical Affairs and Church Governance by a 167 to 70 vote over Auxiliary Bishop Joseph N. Perry of Chicago. — Auxiliary Bishop Mitchell T. Rozanski of Baltimore, as chairman-elect of the Committee on Ecumenical and Interreligious Affairs by a 130 to 105 vote over Auxiliary Bishop Arthur L. Kennedy of Boston. — Archbishop Leonard P. Blair, the head of the Diocese of Toledo, Ohio, who was recently appointed archbishop of Hartford, Conn., as chairman-elect of the Committee on Evangelization and Catechesis by a 135 to 98 vote over Bishop John O. Barres of Allentown, Pa.
— Bishop Oscar Cantu of Las Cruces, N.M., as chairman-elect of the Committee on International Justice and Peace by a 126 to 110 vote over Bishop David J. Malloy of Rockford, Ill.
— Bishop Edward J. Burns of Juneau, Alaska, as chairman-elect of the Committee on Child and Youth Protection by a 118 to 114 vote over Bishop Robert J. Cunningham of Syracuse, N.Y.